The Australian Grand Prix should return to Adelaide, according to a local group which is lobbying the South Australian State Government to make a bid for the event. 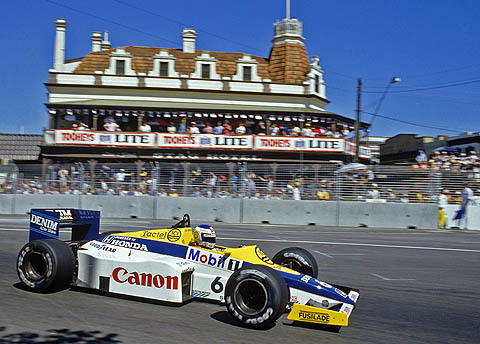 Adelaide hosted the Grand Prix from 1985 until it headed to Melbourne in 1996. The circuit snaked its way around the Adelaide parklands on the outskirts of the city, close to the trendy cafe district, and past the Stag Hotel, after which part of the circuit was named. During its eleven year stay in South Australia, Formula One proved popular, the city almost coming to a standstill with a week-long festival as locals embraced the event. Flags hung from lamp posts throughout the city while posters adorned every inch of vertical real estate. Fans swapped their Cold Chisel t-shirts for team apparel as Grand Prix fever took root, the Formula One paddock couldn't help but be swept up by the enthusiasm. It's something that's missing from the event in Melbourne, something it has never been able to recreate. "It doesn't compare to the great atmosphere that Adelaide had," says Michael Terminello of the race in Albert Park. "There are a lot of people in South Australia and F1 fans worldwide that want Adelaide back on the F1 calendar… It shouldn't have left!" A devoted member of the Tifosi, Terminello's passion extends beyond the casual fan. He is one of the driving forces behind the 'Bring the Grand Prix Back to Adelaide' campaign which has been gathering support via social networking sites Facebook and Twitter. "There are many of us in F1 who would like to race again in Adelaide," wrote Jean Todt in an email to Terminello, before pointing out the commercial realities to which the sport is now a slave. As countries vie to for the right to host a Grand Prix the commercial rights holders, led by Bernie Ecclestone, have been able to dictate terms which are typically stacked in favour of Formula One Management. Prospective hosts are forced to spend millions of dollars in hosting fees, leaving operating margins slim resulting in most promoters running at a loss. Many rely on government subsidies to keep themselves afloat. Costs for the Grand Prix in Melbourne have risen every year since 1996; in 2010 the Victorian state government covered an almost $50.2m (£33.8m) short fall, a figure expected to rise to $55m (£37.1m) this year. Supporters of the event suggest the outlay is offset by the boost to tourism and the local economy, industry monitor Formula Money claims the benefit to Victoria is as much as $125m (£84m). However, a report produced for Tourism Victoria last July contradicts that, suggesting the state saw a $39m (£26.3m) return on its 2010 investment, a loss of almost $11m (£7.4m). It follows on from protest group Save Albert Park which suggests the government has ignored advice from the Auditor General to perform a cost-benefit analysis. It's unsurprising that many Victorian tax payers have now had enough.